The 49m explorer motor yacht Asteria is currently available from Kota Kinabalu for charters in Malaysia, Indonesia and Papua New Guinea through Tim Clark at Ocean Independence. Built in 1970 by Greece’s Anastassiades & Tsortanides yard, Asteria was converted in 2000/2002 by Northport Engineering in New Zealand. 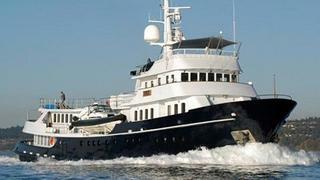 Now fully Lloyds classed, she accommodates 12 guests in six cabins and, carrying a heli-deck, is fitted with zero speed stabilisers and comes complete with a large Northwind aluminium RIB tender. The charter rates on Asteria start from $165,000 per week.